A beautiful view on the huge wooden veranda of Kiyomizudera in Kyoto’s Higashiyama area. Kiyomizudera is the head temple of the Kita Hoso sect (北法相宗). It was first founded in 798, but the buildings in this photo were constructed in 1633. It is a fudasho (an office where amulets are distributed to pilgrims) among the 33 spiritual places of western Japan. 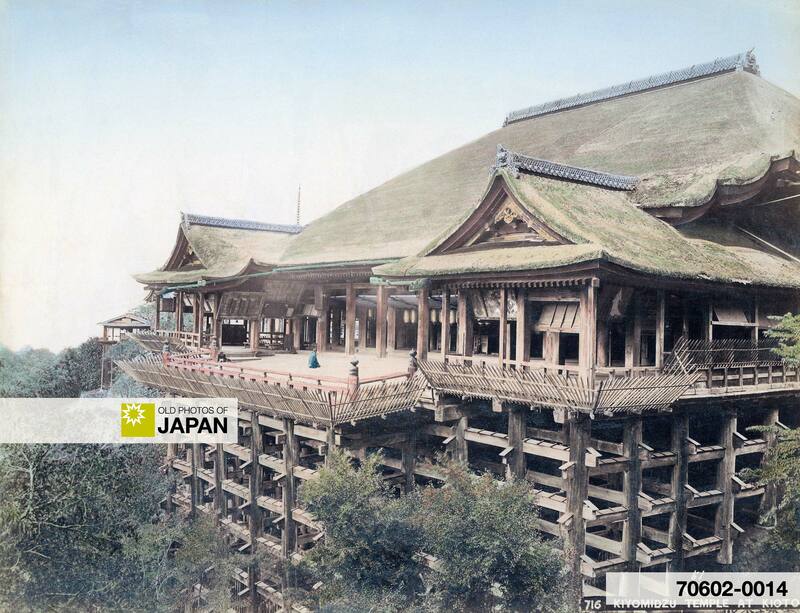 The temple is especially famous for its enormous overhanging wooden veranda. One person can be seen sitting on this veranda, apparently in prayer. The veranda is supported by hundreds of pillars. During the Edo Period (1600-1867), people believed that if you jumped from the 13 meter high stage and survived, your wish would come true. Some 234 jumpers were recorded in the Edo Period (1603-1868), of which 85.4% survived. Most of the jumpers were men in their 20s and 30s, but the archives also record a 12-year-old boy and a 80-year-old man. People of nearby Monzen-cho repeatedly petitioned the temple to create a fence, but that did not seem to discourage the jumpers. They only stopped jumping after the jumps were finally outlawed by the Meiji government in 1872. The jumps would have probably horrified Enchin (延鎮), the monk who founded Kiyomizudera. He discovered the location after having a revelation to find a spring along the river Kizugawa (木津川).1 He ended up at the waterfalls in the Otowa Hills (音羽山), now known as Higashiyama. In 778 he built a small shrine. Some two years later, the legendary general Tamuramaro Sakanoue (坂上田村麻呂, 758-811) came to the area to hunt deer. His wife was pregnant and it was believed that deer blood eased childbirth. Enchin persuaded him that it was wrong to kill the deer, and Sakanoue held a ceremony to repent. He would eventually play a lead role in the building of the temple, which was called Kiyomizudera, the temple of pure water, named so because of the pure waters of Otowa Falls. Over the years, fires burnt down the original buildings. The current buildings date from 1633 when they were rebuilt by Tokugawa Iemitsu (徳川 家光, 1604-1651). The pure waters of the Otowa Falls still stream from the mountain. These days they have been divided into three streams in such a way that visitors can drink from them as they fall down from stone drains. If a visitor drinks from the stream on the left, it will bestow wisdom, To drink from the one on the right assists in finding a husband or wife. The middle stream offers longevity. Drink from all of them and you gain nothing. This is meant to teach restraint and the folly of being greedy. The temple still looks exactly the same today as it does in the above photograph, although it is nowadays crowded with throngs of tourists. In 1994, it became a UNESCO World Heritage Site as part of the Historic Monuments of Ancient Kyoto (Kyoto, Uji and Otsu Cities). 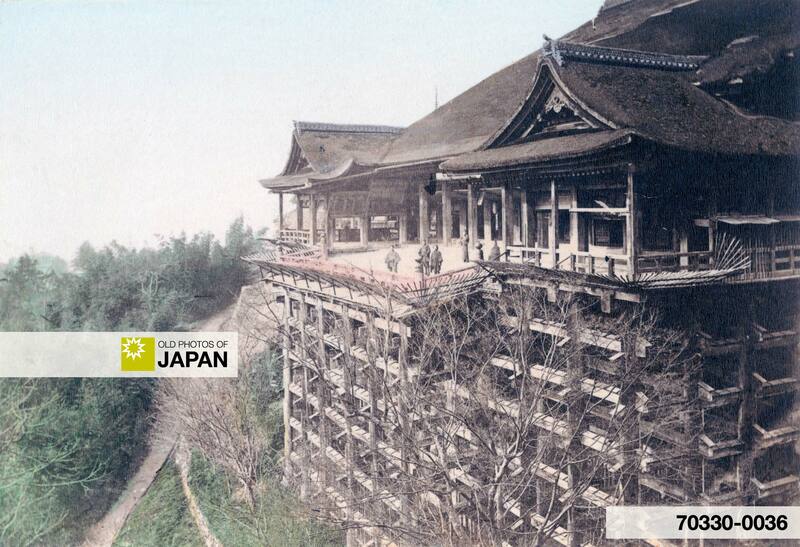 Also see the wonderful image of the entrance area to this temple at Kyoto 1890s • Pagoda at Kiyomizu. The attribution to Reiji Esaki (江崎礼二, 1845–1910) is based on the tentative attribution described in Terry Bennett’s Old Japanese Photographs. This excellent and very well-researched publication is the basis of the attribution of the majority of the photographs on this site. 1 Many internet sites claim that Enchin looked for the source of the Yodogawa, but according to documentation of Kiyomizudera it was the Kizugawa. 2 Panorama Kyoto features some wonderful 360˚ angle photos of Kiyomizudera. Highly recommended. You can also licence this image online: 70602-0014 @ MeijiShowa.com. Once again you have put together a site that opens up a world of information to people who love Asia- I have moved to Missouri USA and plan to build a japanese garden with walking paths and bridges. I was so excited to see your email in my box! I knew something wonderful would happen when I clicked on it!